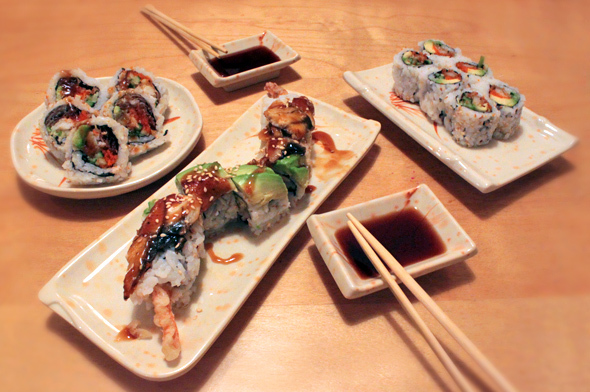 Sashimi Island has reopened under new management as the latest AYCE sushi joint on College. Although no rival to the Annex, this strip of Little Italy has slowly become a destination for these restaurants â so much so, in fact, that it can be daunting to find an actually decent place. Let's be honest, most AYCE is not authentic â it's a category of sushi unto itself, and what it lacks in quality is made up for in quantity. When approaching a new AYCE joint, I look for cleanliness and the actual pieces of fish rather than whispers of protein suffocated in balls of rice. Since the menus are pretty much the same, it's all about the ingredients and execution. Right off the bat, they passed the first test. I couldn't even smell a lingering trace of fishiness as I stepped through the vestibule. Surprisingly, a lot of AYCE fall victim to this and can't even pass the sniff test. The interior has ample booths and a well-stocked sushi bar on display with kitschy bamboo paneling and Japanese tchotchkes on the walls. I prefer this style over the more modern and stark looks that are out there. You usually have to pay attention for the ways that AYCEs cut corners, like watered down soy sauce (yup, seriously). Soy sauce should be a deep brown not a light amber. This wasn't the case here. But the wasabi was a little dried out and the pink-dyed ginger has become begrudgingly acceptable at this point. For most dishes, we asked for no spicy mayo. Another trick to hide poor ingredients is by overloading your taste buds with a fat. The sushi pizza (is this shish indigenous to Toronto?) was one of the best I've had. With a perfectly thin crust, the rice was crispy and the salsa on top was on point with our white tuna topping. 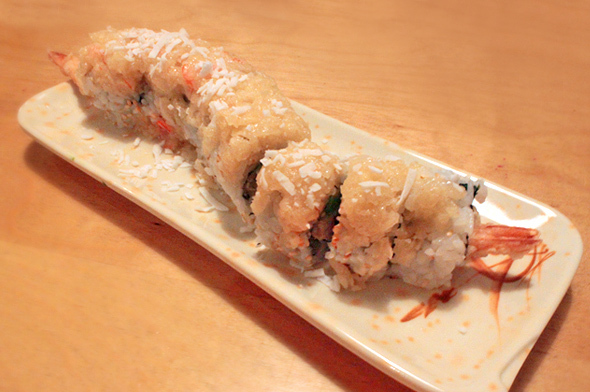 Our favorite rolls were the B.C. Roll, Black Dragon, Snow Dragon and Fire & Ice, the latter of which included a slice of hot pepper in the cut-roll that was delicious. I also love a good hand roll. The tuna and salmon hand rolls had a good ration of fish to rice. They really don't skimp here. Even without the mayo, the rolls nailed the umami flavour Itamae (sushi chefs) strive for. 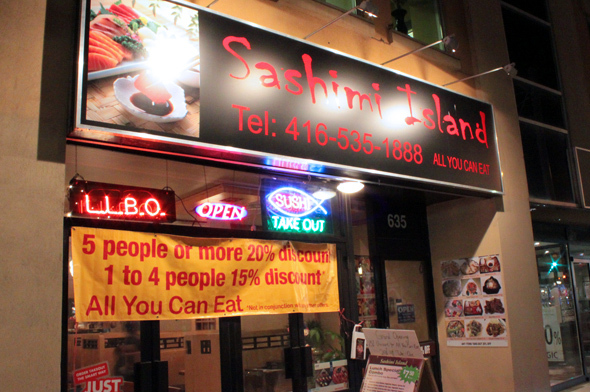 Sashimi Island has a deal right now with 20 per cent off for their grand opening. I'm sure this will be a fixture on the menu for some time. 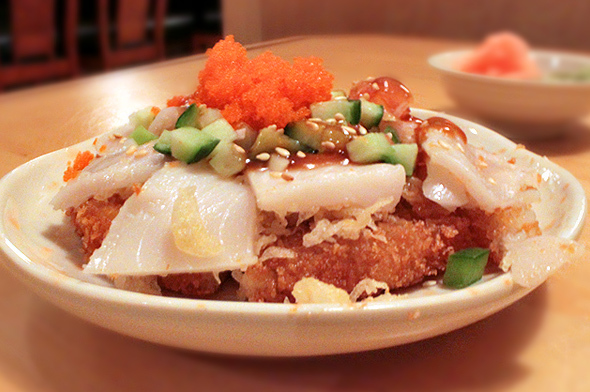 It's definitely worth a spin on your AYCE rotation as it's a solid bang for the buck with above average sushi pizza.